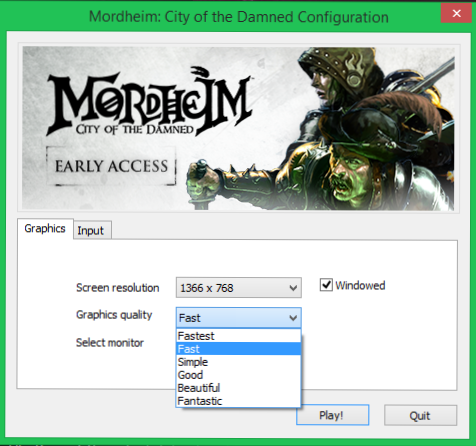 This morning i purchased the early access version of Mordheim City of the Dammed from Steam, this is a game i have been looking forward too for some time. Since a lot of the readers of this blog will have both played the GW version of Mordheim (and most likely have loved it) and play video games i decided to write up a "First Impressions" post of the game. Note that this isn't a review as the game is only in early access but from what i have seen so fare this game has a good chance at being a worthy computer adaption of the game. I will look at 3 aspects of the game for his post, the Mechanics, the Graphics and Performance and the Lore. Starting with the basic turn order all members of both Warbands are assigned an initiative value that determines in which order they can act. When a member can act you move them with the WASD keys in third person camera view, on a side note i enjoy being able to control my Warband in 3rd person, it brings out the detail of the character models and helps with Immersion, you feel more like a Warband Leader than a all seeing god with a birds eye view of the battle. Each member has a number of strategy and offence points that help determine how many actions a warrior can take a turn. Strategy points determine how far a warrior can move and how often they climb/jump/leap. Warriors can only climb/jump down from certain points about the map (marked by a blue circle) and cannot freely climb all over the map. Jumping and climbing cost one strategy point per climb/jump down move and come with a risk of falling and taking damage, if you fail a climb check then the warrior doesn't climb up and falls and takes damage, if a warrior fails a jump check then upon landing the warrior takes damage but can act normally, conversely if a warrior fails a climb check then they can decide to not make the climb again and move normally, or make the climb again (at the cost of 1 strategy point) provided they have enough strategy point. The actual movement mechanics are interesting. If a warrior wants to move from the spot he started his turn in it will cost him one strategy point, this will give him a area to move in, the limits of which are marked by a blue circle, if he wants to move outside of these limits it will cost him another strategy point and so on until all the warriors strategy points are used up or until you have found the right place for the warrior. In addition to all this there are two strategy point stances a warrior can adopt if they wish. The Overwatch Stance applies only to warriors with ranged and will cause the warrior to attack the first enemy warrior to enter his Line of Sight and weapon range. 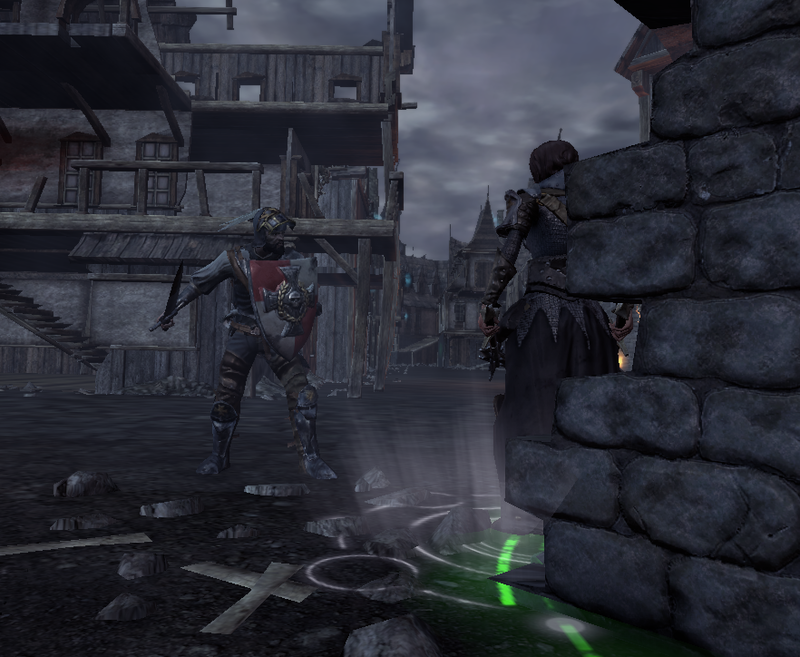 The ambush Stance is similar but it applies to close combat attacks, if a enemy enters the Line of Sight and movement range of a warrior in ambush stance then the ambushing warrior will charge the enemy and make one attack at him. Finally a warrior can chose to delay her turn in the initiative order which will cause him to go at the end of round. Combat works in a similar fashion, with a attack costing a certain number of offence points, warriors can also choose to spend their offence points on a dodge or parry stance which increase the likely hood that the next enemy attack will be nullified. Close Combat attacks have a percentage chance to hit and if they do then they deal an amount of damage between the weapon's min/max damage value. Shooting attacks work in a similar fashion but a shooting weapon will need to be reloaded after a attack has been made with one, at the cost of one strategy point. 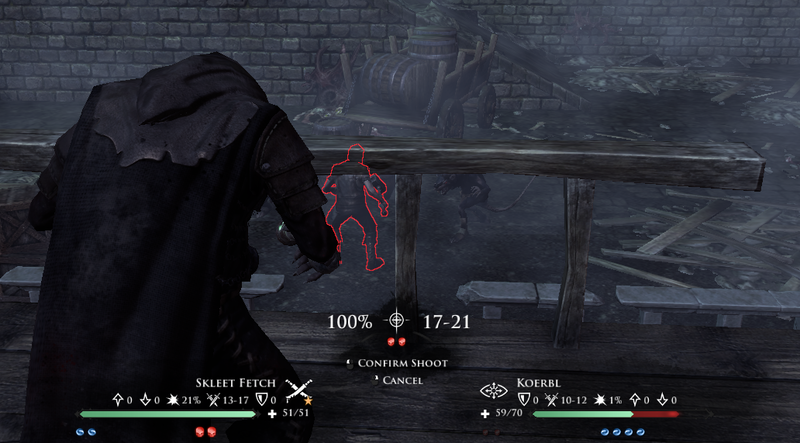 This screen cap shows what a player will see before confirming a attack, the percentage indicates chance to hit while the number to the right of the percentage is the damage range of the weapon. The green bars display health with the red part of the health bar showing how much health will be lost if the attack inflicts max damage. As you can see the games mechanics revolve around the strategy and offence points mechanics, with more skilled warband members having more points, in the games i have played (outside of tutorial games) my warband leader will have enough offence points to make two attacks per turn and adopt a parry/dodge stance. Aside from the basic mechanics there are spells and skills as well as the usual gear related mechanics, with armour decreasing damage and two handed weapons doing more damage than one handed but costing more offence points. As the game is in its very early version there hasn't been a whole lot of focus on more than the basic mechanics but the skills i have seen work well, with each skill costing a number of strategy or offence points. 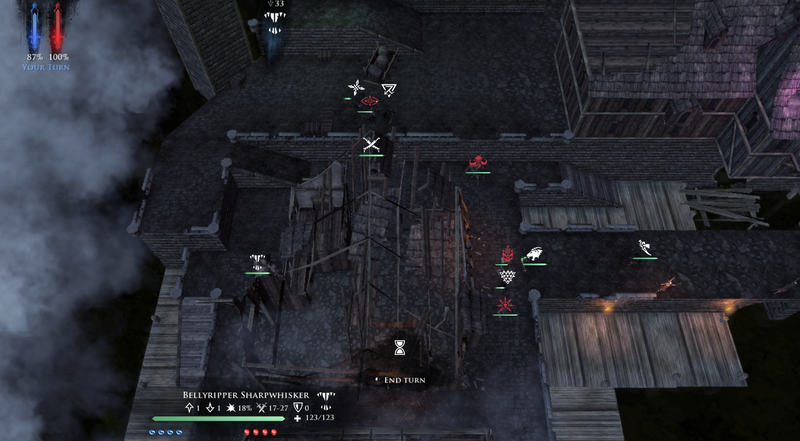 One final feature of this version is the Strategy view mode, which gives the players a birds eye view of the battle field with your warbands positions marked as well as the position of any known enemy warriors. This helps give the player a better overall sense of the battle that the standard third person doesn't, however this cannot be used to move warriors and is very much not the main way players are encouraged to play the game. So far the game has no graphics menu,all players have for graphics is a pop up window when the start the game giving the players a choice of preset graphics options, as well as resolution options. I run the game on the "Fast" setting and even his isn't too bad, with clear detail on all the character models and terrain. I can understand doing this for V 0.1 of Early Access but i look forward too a more conventional graphics menu. Below i have posted a few pictures of the game on "Fast" graphics settings. Lore wise they nail it. 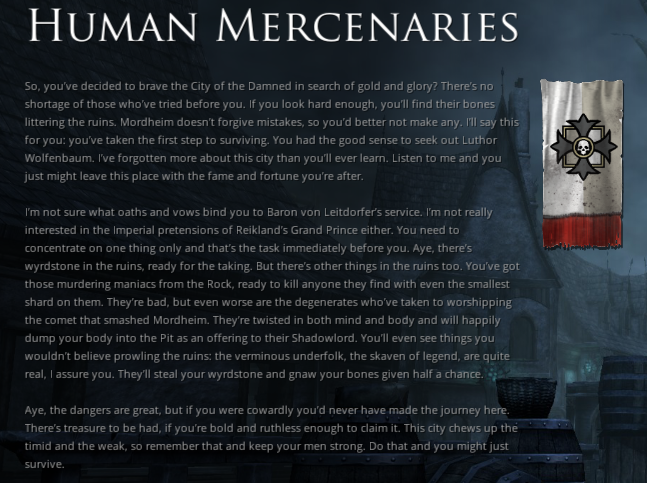 To help illustrate this claim i took a screen cap of the text from the loading screen once you choose which warband to play in a skirmish game, in the early access version you can only play Skaven or Empire Mercenaries. From that you can see they have a good grasp of Mordheim lore and in games at night you can see Morselib in the night sky. The terrain is a good visual representation of Mordheim terrain, with plenty of broken buildings and weird chaos stuff all over the place, in addition many of the levels are misty and gloomy helping to add to the immersion. So all in all its a pretty good early access game, and it has great potential. 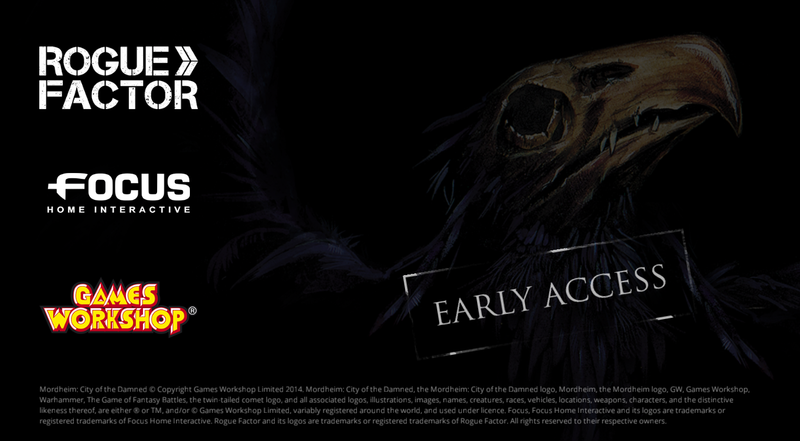 The game devs promise that there will be frequent updates including Warband and Resource management, the Possessed and Sisters of Sigmar Warbands and Injury/Permadeath for Warband members. I wouldn't advise getting the game right now, wait until a few more updates have come out before you get it. I will continue to do posts on the game and how its progressing including first looks at the new features that get added to the game. Until then its back into the City of the Dammed for me and who knows, we may run into each other at some point. Until next time. 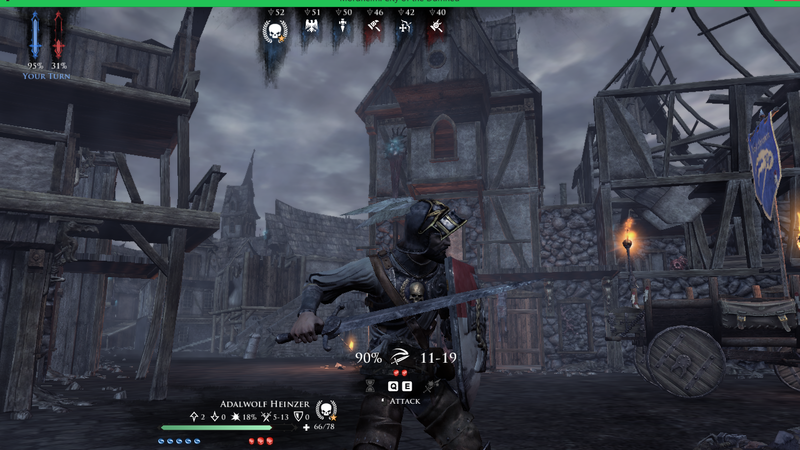 Its weird that it says Skavens on the background screen! Yeah i did notice that,i hope its a typo and they fix it. 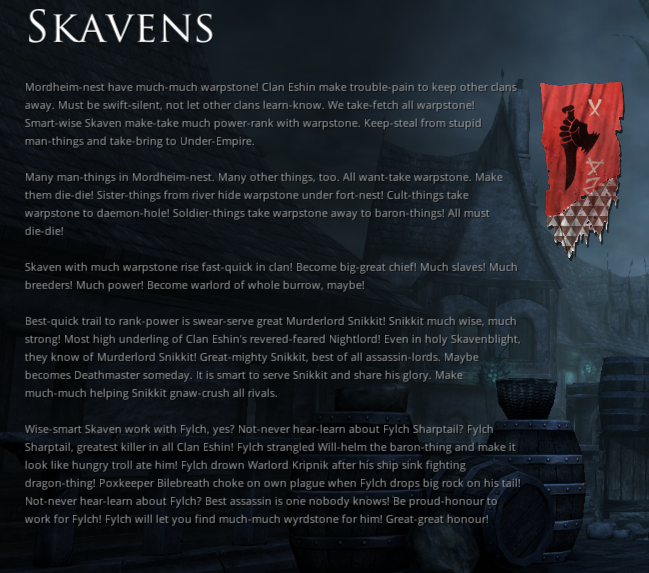 I dont ever recall the Skaven calling themselves "The Skavens"
This. This can only get better! Cool review man and lots of cool screen shots. I cant wait to meet you on the field!